'Having had bad experiences with unprofessional builders in the past it was a welcome relief to find Ward Refurbishments, who were recommended to me by a friend. I was very satisfied with the work done by ward refurbishments. I found that everything that was agreed was carried out without a problem. The work was carried out to a high standard and the workers were always very tidy and always cleared up when they had finished for the day. I would certainly use the company again and I would willingly recommend its services. Mike Triplow, 24 Monmouth Close, Welling. Ward Refurbishment initially installed a completely new bathroom followed by a bathroom for my mother in Eltham. The quality of the work and craftsmanship is exceptional and both rooms have been completely transformed! The estimate given by Lee was not exceeded and there were no ‘hidden’ surprises throughout the developments which were both completed on time. The builders were very polite and ensured that my Mum was kept totally informed throughout the project which kept it all stress free. I would totally recommend Lee and his team and will use them again for any future work we may have. "Ward Refurbishments Company carried out a complete bathroom refurbishment for me in November 2010. 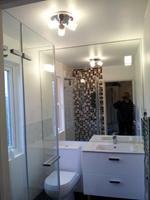 I was thoroughly impressed with the professionalism and workmanship of all the tradesmen. They were completely reliable, friendly, and a pleasure to have working in the house, which was kept very clean and tidy. The work was completed to a very high standard. I was kept informed along the way and encouraged to ask any questions as the work progressed. They obviously take great pride in their work and seek to deliver exactly what the customer wants. Excellent customer service, great value for money and completely reliable. I have no hesitation in recommending this company and would use them again without question." "I was really impressed with Ward Refurbishments throughout. The quote was detailed and very competitive and Lee provided good suggestions and solutions to my many questions. The quality of the work is really good and the small details are done very well. Lee managed the process and handled all issues to make the process as easy as possible. There were a couple of minor issues with the work (as you'd expect) and these have been dealt with very quickly and well - you're not forgotten once the work is done!" "Survey was very detailed as was the quote, the work was completed to a high standard and we are very pleased with the end result"
"I found them to be highly professional from pricing to organising the materials and labour to settlement of the account. He put himself out to help with the design and gave great advice. The work was well planned and the workmen worked very efficiently. The work was of a high quality and was completed on time. Any issues I had with the installation was corrected instantly without any fuss. The workmen were also very reliable. I have experienced some very good companies in the past but they are by far the best I have used and I would not hesitate to use them again." "Lee and Gary were great! Their service and quality of work was excellent, very professional and nothing was too much trouble. They took the time to explain the work and problems that arose during the process, talked through the issues, and worked to realistic time frames. They were always on time, would call ahead if running late and their friendly manner and genuine interest in the job would mean that I would call on them again for other work in the future. I highly recommend their services, their prices were reasonable and I was extremely happy with the overall product." "Excellent work. Very professional from start to finish. No hesitation in recommending to family or friends." "Great value for money. Was really pleased with the work carried out and would definitely use again." "Cleaned up throughout the operation which meant a lot to me. All in all a job well done and good value for money."